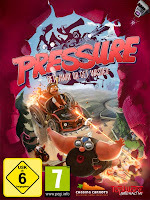 Pressure merupakan sebuah game baru temen-temen. Jadi disini kita balapan juga, nembak-nembak juga.. tapi ada ceritanya. Kendaraaan yang kita gunakan juga bukan kendaraan biasa temen-temen. Tapi kendaraan keren yang dilengkapi dengan perlengkapan dan peralatan canggih. 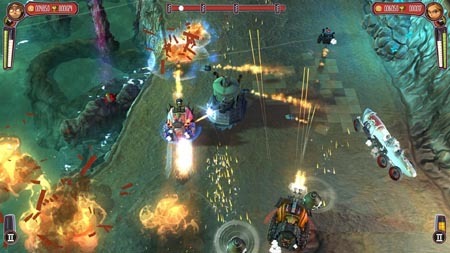 Driving a four-wheel off-road vehicle, hung with a machine gun and rocket launchers, the game's protagonist tries to frustrate arhiplohisha Earl, who decided to drain the stimpankovy a world in which the action of the game and build up its spas. The classic view from the top, cartoon style, big bosses and the system gradually "upgrade" of transport - are key features of the project. And the whole plot of the game "Pressure" revolves around a villain who decided to drain all the rivers of water and send them to your personal spa. There is nothing more fun than a wind-up race, which involved a wide variety of cars. But more striking is the fact that you have the opportunity not just to ride a car, but also turn it into a firing platform. 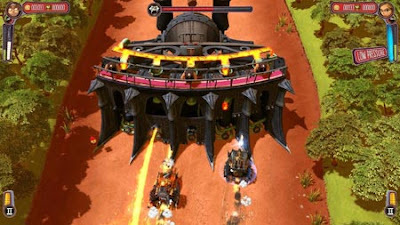 As it should be according to the rules of the genre, you start the race on the slowest car, which is equipped with a simple machine gun. Over time, your chances increase significantly: you can buy guns, machine guns, mines and rocket throwers. And all this can be improved by good military, combine, repaint and complement. Races are becoming more dynamic and dangerous: the damage of all weapons is impressive and more missed shots prevent you generally get to the finish line. Regarding the graphic component, it is easy for adjustment. Look forward to high-quality graphics and rich special effects.